"Dr. Thomas Dorothy had a vision that came to him in 1932, where lay people had a place to get organized," said Dr. Marabeth E. Gentry, current president of the National Convention of Gospel Choirs & Choruses (NCGCC), about its humble beginnings. "It's the comradery...it's the spirituality...it's the beautiful music...the family atmosphere. We're a large family reunion." Dr. Gentry took over as president of the NCGCC in 2010 when then president Bishop Kenneth Moales, Sr. passed. He succeeded founder Dr. Thomas Dorothy who served from 1932 to 1993. The NCGCC was an event where up and coming Gospel singers and songwriters could have a stage to perform. While there they listened to guest speakers who inspired them to keep going. NCGCC will be celebrating its 84th year when it arrives in my hometown of Baltimore August 5 - 11, 2017 at the Baltimore Marriott Waterfront Hotel. The National Convention of Gospel Choirs & Choruses will be hosted by Elder Shawn L. Bell and the Chairman of the NCGCC Board Rev. Dr. Derrick E. Roberts. Guest speakers include Rev. Dr. Lester W. Taylor, Bishop Walter Scott Thomas, Dr. Jamal Bryant, Archbishop Alfred A. Owens, Bishop Millicent Hunter and Dr. Donte L. Hickman, Sr. Guest performers include Rickey Dillard, Charles Butler and Trinity, Jonathan Nelson, Maurette Brown-Clark, JJ Hairston, the Baltimore Mass Choir and many others. 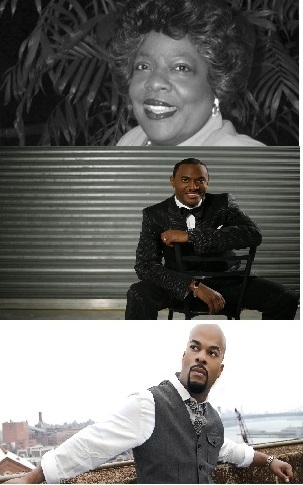 "Some of our great artists such as Hezekiah Walker...years ago came. Look at them now...Donald Lawrence...you can go back to the Cleveland Singers. Aretha Franklin in Detroit, Della Reese is a part of us, Dinah Washington...," said Dr. Gentry about the many aspiring artists the convention help put a spotlight on. "Dr. Dorothy saw a vision, a place where songwriters and performers can come and do their music and listen to others do their music," she explained. Dr. Gentry said before Bishop Moales, Sr. passed away in 2010 he said to her in 2008 that he was going to hand the mantle over to her. She said, "No sir!" Today, against her wishes, but heeding to God's will she now serves as President of the 84 year-old NCGCC event that has provided a free stage to those in Gospel looking to develop their skills. "A Spiritual thing came into my room," Dr. Gentry explained when asked why she changed her mind. "It said. ‘I will give you everything...I will not forsake you, just do what I tell you,' and I did a walk of faith." I experienced "Spiritual thing" in my life many times before when I said to God, "Not me, this task is too hard." But I knew as I was saying "no" that I would do it if it was God's will even through I knew the road would be hard, but God certainly gave me and is still giving me all that I need and I have seen mighty things happen because I took that walk of faith. I too have a national event God gave to me called the "Uplifting Minds II" entertainment conference - it is 18 years old held annually in Baltimore and Los Angeles. It too inspires and educates participating artists who have gone on to do great things. Dr. Thomas Dorothy Sr. was considered the "father of Gospel Music" and he wrote over 400 songs, which include "Take My Hand, Precious Lord." The convention's goal is to foster and promote an appreciation and high standard of excellence for Gospel music and Gospel music performances. It offers session for youth and adults who seek to enhance their skills as singers, instrumentalists, educators and leaders. Find out more about the National Convention of Gospel Choirs and Choruses by logging onto www.NCGCC.com. SYNDICATED COLUMN: Eunice Moseley, has an estimated weekly readership of over ¼ million with The Pulse of Entertainment. She is also a Public Relations Strategist and Business Management Consultant at Freelance Associates, and is Promotions Director (at-large) for The Baltimore Times. www.ThePulseofEntertainment.com. EVENT: 18th annual "Uplifting Minds II" Free Entertainment Conference (Baltimore and Los Angeles in October, 2017). Entertainment Business panel and national talent showcase competition (vocal, songwriting and dance) with over $13,000 in prizes. www.UpliftingMinds2.com.